I'm interrupting this usually scheduled Brights blog with a bit of an off-piste post. 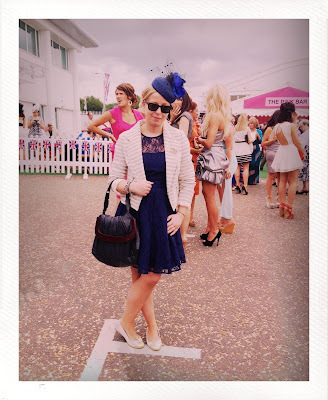 What with the outdoor events calendar firmly under way and several of my friends asking what I'd recommend for a day at the races or the polo, I thought I'd do a little post about what I wore to the Investec Epsom Derby Ladies Day last week. I was there helping to pick stylish race-goers for WhatBestToWear.com's competition and of course, we had to adhere as much as possible to the dress code - smart dresses and hats, etc. Now, I love a good hat but I've never really worn a formal one as up until last week, I was a race day novice if I'm perfectly honest - luckily, I picked up my hat the other week in preparation for Ascot later this month but still had no appropriate dress! Cue a good level of panic, including the standard race around Topshop the night before to see if I could find anything to wear as most of my dresses are either black or casual. Having panic bought a structured black dress, on the tube home I had a sudden fashion epiphany (fash-iany?) - the perfect dress was hanging in my wardrobe. This navy structured skater dress with lace overlay and little grosgrain cap sleeves from Warehouse fitted the bill perfectly, matched my navy and black hat and was comfortable to boot. It had been languishing in my wardrobe since Christmas and I figured it that if ever there was an occasion for it to make its debut, Ladies Day was the one. Unfortunately, the navy version is long gone but a very summery cream version is still available [here]. The best part? It's now on sale, from £80 to £60. I may very well need to get it to wear to Ascot. Worn with: Cream and navy stripe jacket, Primark; cream and gold pumps, Office; hat, Marks & Spencer; bag, Marni; Wayfarers, Ray-Ban.